Last Chance! FINAL Deadline TONIGHT in the Canadian Cancer Society VIP Lottery! Published on October 16, 2018 at 9:15 pm . 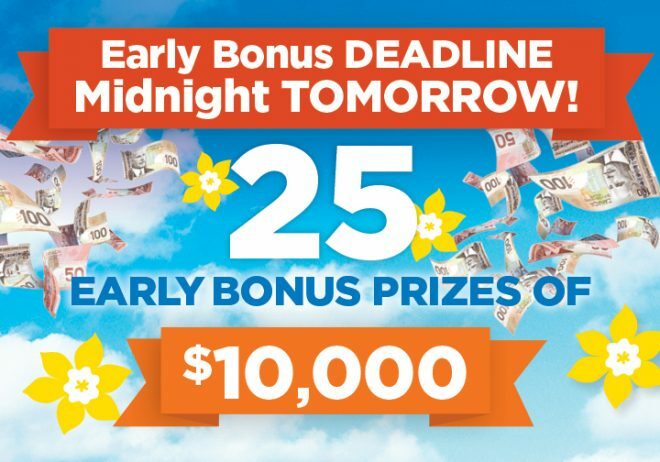 Ontario, October 17, 2018 — Last Chance – Lottery Closes TONIGHT! 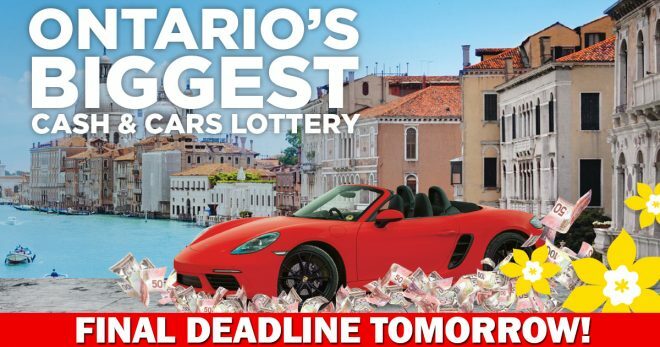 This is your absolute final opportunity to order a ticket to win in Ontario’s Biggest Cash and Cars Lottery. As of midnight tonight, the Canadian Cancer Society VIP Lottery will be closed. The Canadian Cancer Society has more impact, against more cancers, in more communities, than any other cancer charity in Canada, yet there is still so much more we need to do. Your ticket helps us continue to lead the fight. The Countdown is on. Order your ticket before it’s too late! FINAL Deadline TOMORROW in Canadian Cancer Society VIP Lottery! Published on October 15, 2018 at 9:00 pm . Ontario, October 16, 2018 — ONLY 1 DAY LEFT until the FINAL DEADLINE! Ontario’s Biggest Cash and Cars Lottery will soon be closed. You’ve only got ONE DAY LEFT to order your tickets for the Canadian Cancer Society Lottery. Don’t Wait Another Minute…Order NOW! Last Chance! The Early Bird Deadline is TONIGHT for the Canadian Cancer Society Lottery! Published on October 11, 2018 at 9:02 pm . Ontario, October 12, 2018 — The Clock is Ticking… Time is Running Out! Only a few hours remain until the Early Bird Deadline. 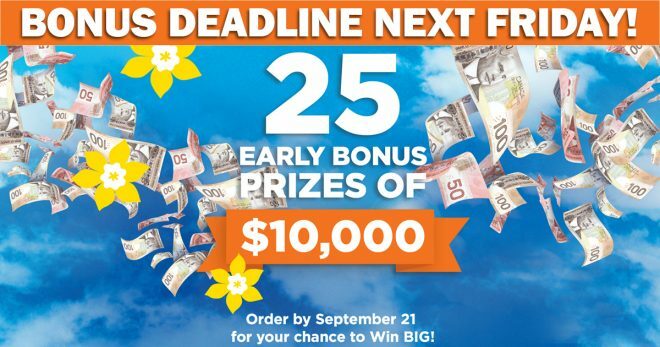 Order your tickets for the Canadian Cancer Society Lottery before the clock strikes midnight. With 1 in 5 OddsΔ of Winning and only 80,000 tickets, the Canadian Cancer Society VIP Lottery gives you the Best Chance to WIN BIG and make a BIG DIFFERENCE in the fight against cancer. The clock is ticking… Order NOW! Ticket are already 90% sold, so don’t wait another minute. Published on October 9, 2018 at 9:26 pm . Ontario, October 10, 2018 — HURRY! The Early Bird Deadline is Only 2 Days Away! 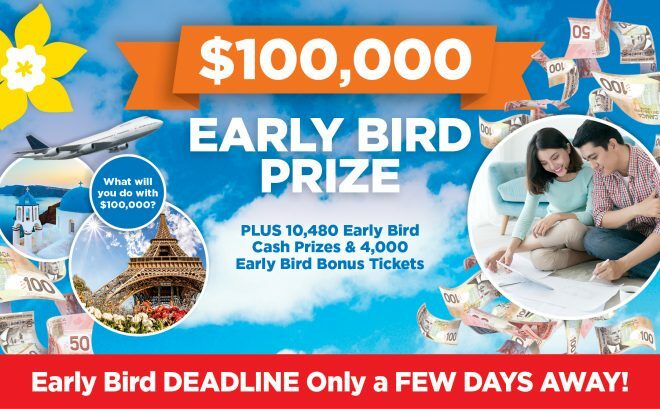 The Early Bird Deadline is this Friday, for the Canadian Cancer Society VIP Lottery, but tickets may not last that long. Over 90% of the tickets have been sold. Time and tickets are running out. Order your tickets today. 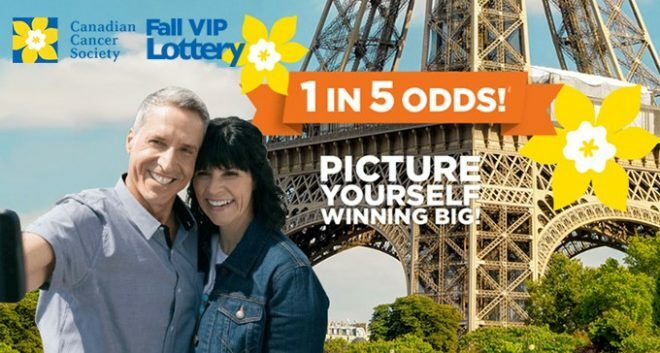 With 1 in 5 OddsΔ of Winning, the Canadian Cancer Society VIP Lottery gives you the Best Chance to WIN BIG and make a BIG DIFFERENCE in the fight against cancer. The clock is ticking, and time is running out. Ticket are already 90% Sold. Last year’s VIP Lottery sold out early, so be sure to get your tickets before it’s too late. The Canadian Cancer Society has more impact, against more cancers, in more communities, than any other cancer charity in Canada, yet there is still so much more we need to do. Your ticket helps us continue to lead the fight. Get your tickets TODAY! Tickets are Already Over 85% Sold - Don’t Wait! Published on October 3, 2018 at 10:11 pm . Ontario, October 4, 2018 — Act Now! The Early Bird Deadline is Next Friday! The Early Bird Deadline is next Friday, for the Canadian Cancer Society VIP Lottery, but tickets may not last that long. Over 85% of the tickets have been sold and a complete sellout is on the horizon. Time and tickets are running out. Order your tickets today. ✔ Win a Car EVERY DAY in November! With 1 in 5 Odds of Winning, the Canadian Cancer Society VIP Lottery gives you the Best Chance to WIN BIG and make a BIG DIFFERENCE in the fight against cancer. Tickets are already 85% Sold. Last year’s VIP Lottery sold out in record time. Be sure to get your tickets before it’s too late. The Canadian Cancer Society has more impact, against more cancers, in more communities, than any other cancer charity in Canada, yet there is still so much more we need to do. Your ticket purchase helps us continue to lead the fight. Get your tickets TODAY! Published on September 20, 2018 at 9:11 pm . Ontario, September 21, 2018 — Act Now! The Early Bonus Deadline is Midnight TONIGHT! This is your last chance. 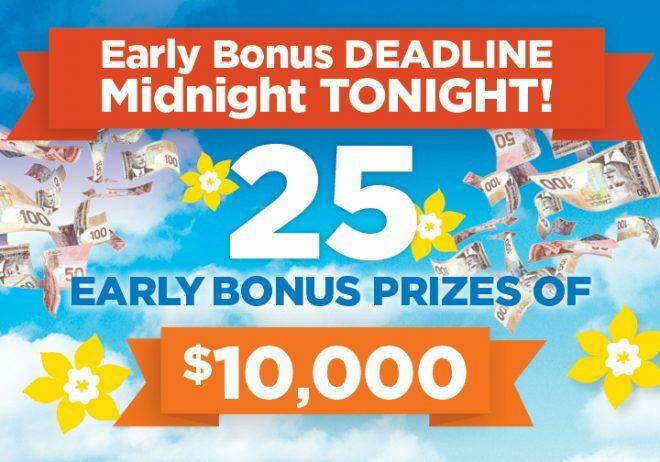 Time is running out to get your tickets to be in the draws for 25 Early Bonus Prizes of $10,000 cash! The Early Bonus Deadline is Midnight TONIGHT! Don’t miss out. Order your tickets today. Need more reasons to order? ✔ OUR BEST 1 in 5 Odds of Winning! Tickets are already 75% Sold. Last year’s VIP Lottery sold out in record time and it looks like it’s going to happen again this year. Be sure to get your tickets before it’s too late. Published on September 19, 2018 at 9:33 pm . Ontario, September 20, 2018 — Act Now! The Early Bonus Deadline TOMORROW! Looking for an extra 25 reasons to order your Canadian Cancer Society VIP Lottery tickets early? How about 25 Bonus Prizes of $10,000 cash? The Early Bonus Deadline Tomorrow! Don’t miss out. Order your tickets today. Ticket are already 70% Sold. Last year’s VIP Lottery sold out in record time and it looks like it’s going to happen again this year. Be sure to get your tickets before it’s too late. HURRY! Deadline is Only 2 DAYS AWAY! Published on September 18, 2018 at 10:35 pm . Ontario, September 19, 2018 — Act Now! The Early Bonus Deadline is Only 2 DAYS AWAY! Looking for an extra 25 reasons to order your Canadian Cancer Society VIP Lottery tickets early? How about 25 Bonus Prizes of $10,000 cash? The Early Bonus Deadline is only 2 Days Away! Don’t miss out. Order your tickets today. Published on September 13, 2018 at 9:01 pm . A special note from the publisher: For more than 17 years, the Home Lottery News has helped support charities. Now we have a chance to support the efforts dedicated to fighting cancer. The Canadian Cancer Society needs support now more than ever to achieve its vision of a world where no Canadian fears cancer. Ontario, September 14, 2018 — Alert! Early Bonus Deadline is Next Friday! 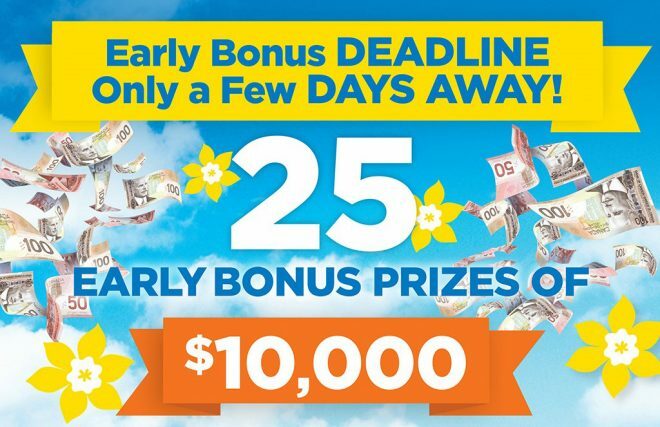 There are 25 Bonus Prizes of $10,000 cash to be won in the Canadian Cancer Society VIP Lottery. If you order your tickets in the next week, you will have 25 extra chances to win big in Ontario’s Biggest Cash and Cars Lottery. Don’t miss out. Order your tickets now. Your ticket in the Canadian Cancer Society VIP Lottery gives you the best chance to win $1 million♢. There are only 80,000 tickets available and an overall 1 in 5 odds of winning♢. With more big prizes than any other Ontario charity lottery, this is the one to get. 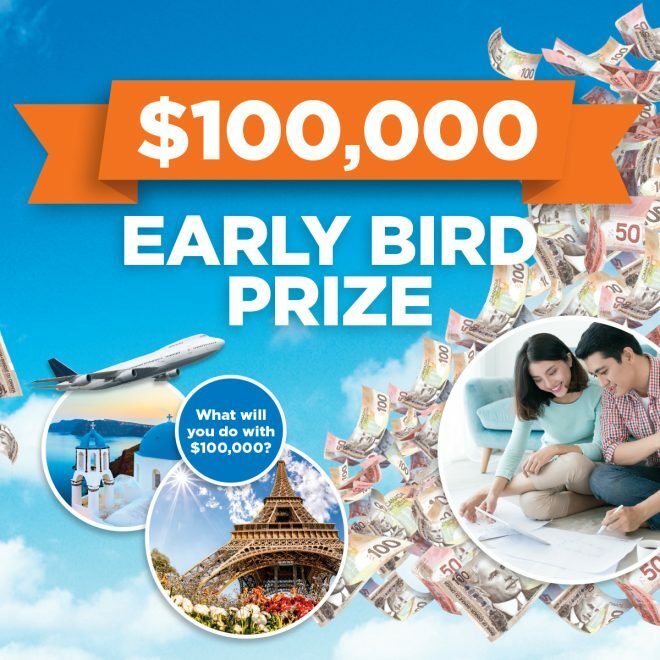 There are millions in prizes to be won in the VIP Lottery, including DailyΔ Car Prizes, DailyΔ Cash Prizes, thousands of Early Bird Prizes and five Grand Prizes. Get in now and you’re in for all these draws as well. Over 50% of the VIP Lottery tickets are already sold. Published on August 28, 2018 at 8:11 pm . Ontario, August 29, 2018 — Breaking News! 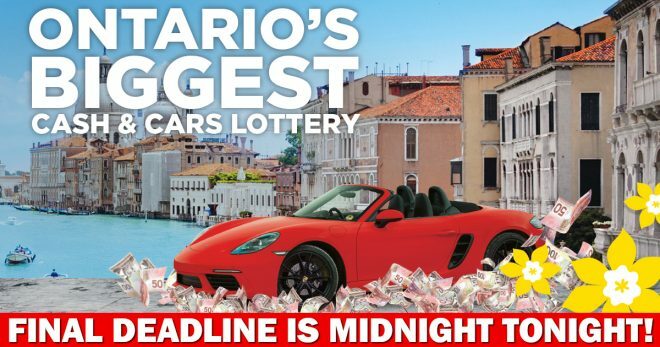 Quicker than you can say “Ontario’s Biggest Cash and Cars Lottery”, over half of the tickets are already gone. Last year’s VIP Lottery sold out in record time and it looks like it’s going to happen again this year. Be sure to get your tickets before it’s too late. More Big Prizes and Your Best Chance to Win Big! With your Canadian Cancer Society VIP Lottery ticket, you have the best chance to win a big prize and the best chance to win $1 million♢. This lottery offers more big prizes than any other Ontario charity lottery and amazing 1 in 5 odds of winning♢. Plus, there are only 80,000 tickets available. Order Early and Win Even More! Order your tickets today and you will be entered to win the 25 Early Bonus Prizes of $10,000 cash. That’s 25 extra chances to win big, just for buying early. Check out all the DailyΔ Car, DailyΔ Cash and millions in prizes to be won in this year’s VIP Lottery. Your Support Makes a BIG Difference. The Canadian Cancer Society has more impact, against more cancers, in more communities, than any other cancer charity in Canada, yet there is still so much more we need to do. Your ticket purchase helps us continue to lead the fight. Get your tickets TODAY!